Columbia conjures images of a violent, cocaine-filed country with numerous kidnappings. Those violent days are coming to an end and there is now an influx of tourists. Columbia has beaches and colonial cities in the north, big cities and mountains in the central region and archeological sites and natural beauty in the south. On the Caribbean Coast is the city of Santa Marta, but most tourists stay in the nearby village of Taganga. The attraction is a nice strip of beach, open-air restaurants, pet birds landing on visitor’s shoulders and many houses built into the rocky outcrop surrounding the beach. Santa Marta has a small beach as well where many come for the sunset, but that’s not the main attraction of the city. Santa Marta is a colonial city with an attractive cathedral, theater and Plaza Bolivar. It is also a great place to try the numerous fruit drinks of Columbia including papaya, banana and strawberry. Near Santa Marta is the Quinta de San Pedro Alejandro, which was the residence where Columbian liberator Simon Bolivar died. One can see his deathbed, his stagecoach, some history of Columbia and a spray painted wall which depicts his life. 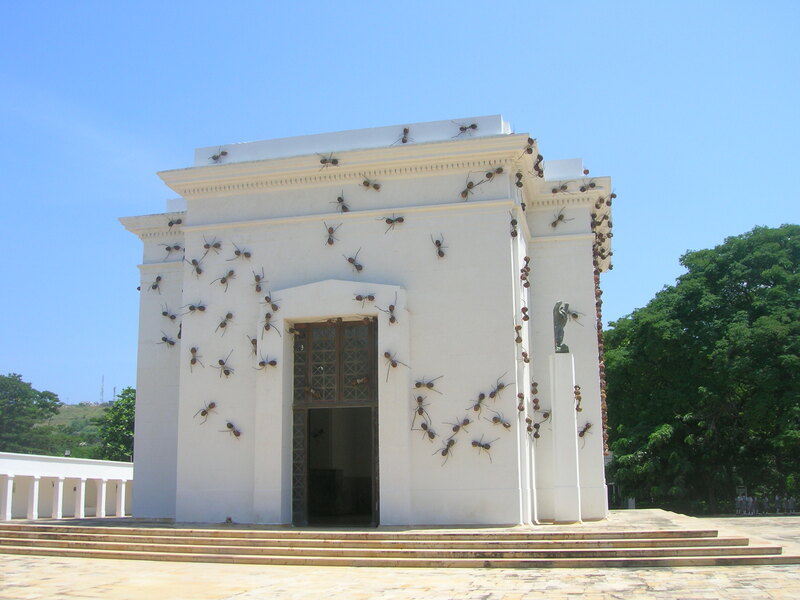 Next to the residence is a building which has three feet ants (there not alive) scaling both his tomb and the enclosing building. Apparently this is art. Next to the tomb there is an art museum, which has paintings that I consider art. A more famous city on the coast is the walled city of Cartagena. Although attractive, there are many more tourists and touts which lessens the ambiance. Nevertheless, the old city has an archeology museum, naval museum and the Iglesia de San Pedro Claver, dedicated to a priest who helped black slaves. His tomb is on the first floor along with some church art and on the second floor there are Haitian paintings. Park Bolivar is a center of activity with dancing, mostly African style, and a nearby cathedral, gold museum and inquisition museum which show the tools of torture including those attached to the heads of the unlucky heretics. At night there are other attractions. When the sun sets, many people sit on top of Las Muralles, which are the old city walls. There are several places to socialize as well. One popular area, Plaza de los Coches, is just inside the city walls, and was used as a slave market. There are now many bars and restaurants, including the Hard Rock Café, to visit. About 35 miles northeast of Cartagena is the Volcan de Lodo El Totumo, which is not a typical volcano. The volcano is only about 50 feet high and thus is easy to scale. Furthermore, the volcano is not spewing lava rather it is spewing mud as there is decaying organic matter below the volcano’s mouth. Descending into the mud, one feels as if they are getting stuck in chocolate pudding. For a small fee, locals will give a mud bath with massage which apparently is therapeutic especially for the skin. After climbing out of the volcano and walking to a nearby lagoon, locals, again for a small fee, will wash visitors off. This is refreshing as the mud bath is extremely gritty and requires cleaning mud out of one’s ears for the next week. On the way back many tours will stop at San Cristobel, which has a beach and is a fishing village. Best known for the home of the drug cartel led by Pablo Escobar, Medellin has steadily recovered from her brutal past. Much of Escobar’s money went to help the poor people of Medellin, who elected him to Congress in 1982. Many of these poor people live in the hills surrounding the center of Medellin, which can be visited on a combination cable car and metro ticket. On my trip, the cable car stalled and swayed for about two minutes which was unnerving. The hills allow for scenic views but it is a bit of a dodgy area. I was fortunate to be in Medellin as they were setting up for the Flower Festival, in which the people who live in the country descend from the hills to the city with flowers and then have a big party. Due to the upcoming Flower Festival, most of the Medellin attractions were free. The Museo de Antioquia is a detailed collection of art from the pre-colonial, colonial, independence and modern times. Outside the museum there are several curvy sculptures, created by one of the more famous Columbian artist, Botero. Also free were the botanical gardens, the Jardin Botanico Joaquin Antonio Uribe, in which there are many lizards, monkeys and children scampering about the gardens as well as an extensive cactus garden. The capital of Bogota is dominated by the Plaza de Bolivar, which has many pigeons and is flanked by the Palacio de Justicia (justice palace), Alcaldia (city hall), Capitolio Nacional (Congress) and Catedral Primada (cathedral). Nearby is the 20th of July Museum which has a nationally significant flower vase. As locals were clamoring for independence from Spain, the indigenous people came up with a plan to get their independence. They would ask a Spaniard living in Bogota who had an import/export business containing expensive goods if they could borrow a vase for a big city party. They knew he would say no, and indeed when they asked to borrow the vase, the Spaniard said that they could buy it but not borrow it. Saying that he would have lent the vase to other Spaniards and that this was a slap in the face, the locals revolted and thus the vase is historically important. There are many other attractions in central Bogota. The Museo de Oro (gold museum) has over 30,000 gold pieces. In the same complex is the Botero Museum, with many more of the curvy artwork of Botero along with works from Picasso and Dali. The university has rotating, temporary exhibitions including one depicting the displacement of three million Columbians during the civil war, the largest recent displacement excluding the current one in Sudan. The museum depicts the dislocation through photos and children’s drawings. The Police Museum has items from the early police force including a prison car and more modern uniforms, guns and rubber bullets. Of more interest is the exhibit in the basement, which explains how the Columbian police caught and killed drug lord Pablo Escobar. There is surveillance equipment donated by the US as well as the taped conversations Escobar had with his associates. The museum contains Escobar’s gold rimmed glasses and silver guns, as well as portraits of some of the other Columbian criminals. There is also a tile containing Escobar’s blood from the roof where he was shot to death. Near Bogota is the city of Zipaquira, which contains a noteworthy salt cathedral. The salt cathedral is located in a salt mine, one can lick the walls. The Stations of the Cross, mostly crosses of various designs, can be seen as visitors walk down the mine to the cathedral. Some attractive items are a nativity scene made out of salt and several salt angels. The actual cathedral is a combination of salt and stone and can hold over 8,000 people. There are many archeological sites to the west and east of San Agustin in southern Columbia. A neat way to see the sites to the west of the village is by horse, as it includes a look at the countryside, including some deep valleys. In many areas there are coffee, bananas, and corn grown together and thus no land is wasted. The park includes several statues, many over 1000 years old. Some have elongated jaguar teeth with eagle eyes, and are dedicated to the moon god, sun god, and sacrifice and creation myths. To the east are more statues namely at Alto del Mortino and Alto de las Guacas and a nice waterfall, Salto del Mortino. Not many tourists venture further south as there are fewer attractions and this is where most of the displaced Columbians were, so security is more of a concern. Popayan is another colonial city with an old bridge and a hill to fly kites. The most notable museum is Casa Museo Mosquero, which is the house of General Mosquero, Columbia’s president from 1845 through 1867. 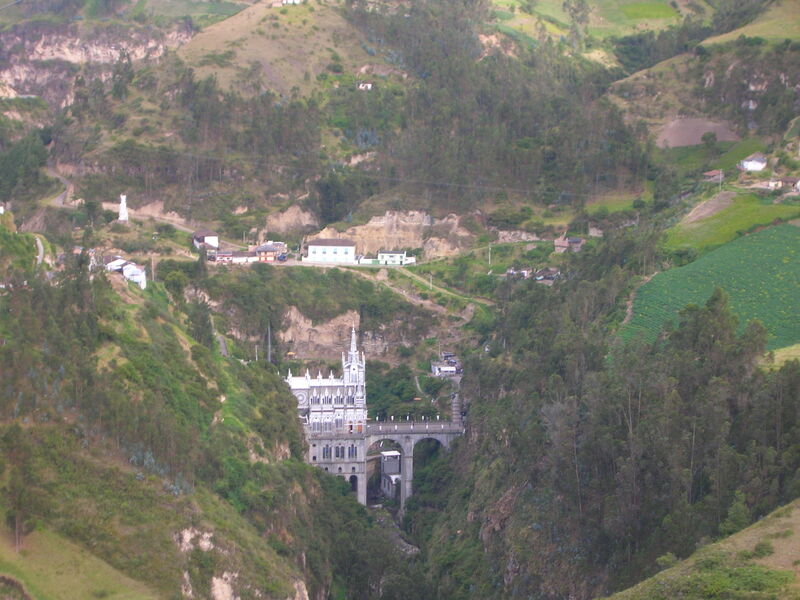 Further south is the border town of Ipiales with the important Santuario de Las Lajas, south of the city. This church is built into an impressive river gorge and houses a large rock, which serves as the altar, where the likeness of the Virgin Mary was supposed to have appeared. There are many pilgrims here who place petitions to the Virgin Mary around the rock and drink the pure water from the church. Before traveling to Columbia, I thought of the 1980’s movie, Romancing the Stone, where Michael Douglas and Kathleen Turner bravely navigate their way through Columbia. There is still adventure to be had in Columbia, especially if you’re insane enough to go into the drug-producing jungles in the east or northern Darien Gap. However, most of Columbia is now safe to visit and the country feels as if it is being reborn.